Coloured Guinea grass (Panicum coloratum L.) is a tufted (erect, geniculate or decumbent), annual or perennial grass, 10-150 cm high. Its morphology is highly variable, from fine and small (var. coloratum) to large and robust (Kabulabula type). The roots are fibrous and some varieties are rhizomatous, with short or long stolons (Ecocrop, 2010; Quattrocchi, 2006; Cook et al., 2005). Panicum coloratum is a leafy species, the colour varying from dark green (var. coloratum) to bluish (var. makarikariense). The leaves are generally glabrous on the upper side, 5-40 cm long x 4-14 mm wide (Quattrocchi, 2006; Cook et al., 2005; Partridge, 2003). The inflorescence is a pyramidal panicle, 6-30 cm long, bearing green and purple spikelets (Ecocrop, 2010; Quattrocchi, 2006; Cook et al., 2005). The seeds are subject to shattering (Quattrocchi, 2006). Panicum coloratum is a hardy species that establishes readily and provides a palatable pasture, particularbsly in the early stages of regrowth (Cook et al., 2005). Panicum coloratum grains are edible (Quattrocchi, 2006). Panicum coloratum originates from Africa and is now found in many tropical and subtropical regions (Freckmann et al., 2007), between 30°N and 33°S, from sea level to an altitude of 2100 m (Ecocrop, 2010). It grows during the warm season on moist or seasonally waterlogged heavy soils, grasslands (both wooded and damp meadows), open woodland, lawns, gardens, hedges, river beds, canal banks or in depressions (Quattrocchi, 2006; Ecocrop, 2010). Panicum coloratum grows best during the warm season, with temperatures ranging from 18°C to 36°C, with an annual mean temperature around 22°C, and annual rainfall ranging from 400 to 2000 mm (depending on the variety), on fertile sandy to clay soils. Panicum coloratum is drought tolerant and also moderately tolerant of flooding and waterlogged conditions. Var. makarikariense is particularly suitable for flooding conditions (Cook et al., 2005). 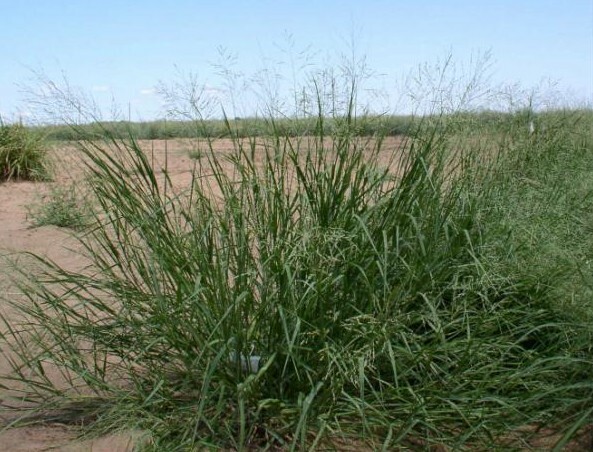 Panicum coloratum can withstand significant levels of salinity. It is susceptible to frost but can recover after it. It also recovers from fire (Cook et al., 2005; Suttie, 2000). In Argentina, it has been possible to make high grade quality hay with Panicum coloratum cut during spring. It was easy to process into hay and there was no risk of moulding (Petruzzi et al., 2003). Yields vary between 4 to 23 t DM/ha (Ecocrop, 2010; Cook et al., 2005). Panicum coloratum responds positively to N supply (Cook et al., 2005). Pastures are very persistent and can withstand heavy grazing, but Panicum coloratum should not be grazed heavily during establishment. It can be sown with other grasses or legumes (Cook et al., 2005). Panicum coloratum is used as a soil binder because of its extensive root system and its ability to spread quickly (Quattrocchi, 2006). The nutritive value of Panicum coloratum varies with maturity, age of regrowth, fertilizer level, season and cultivar. The stage of maturity (or regrowth age) of the grass is the main source of variation. In Panicum coloratum cv. Bambatsi, the crude protein of the leaves decreased from 22% (DM) in young grass to 10% in mature grass. The NDF level increased from 62 to 75% between 4 and 10 weeks (Lloyd, 1981). Cases of toxicosis have been reported in sheep, goats, cattle and horses grazing pastures or fed hay of Panicum coloratum. Clinical signs include icterus, photosensitivity, intermittent colic and fever, weight loss, and hepatic encephalopathy. Sheep are the most vulnerable, and stressed lambs placed on early regrowth following dry conditions are at most risk. Saponins in the grass are assumed to produce crystalloid substances which obstruct the bile duct, resulting in damaged liver function and secondary photosensitization that are lethal to lambs (Lloyd, 2007; Cook et al., 2005, Kahn, 2005). Affected animals should be removed from the Panicum coloratum pasture, fed good quality hay and protected from sunlight. Treatment of the photodermatitis with antimicrobial or softening creams may be needed in severe cases (Kahn, 2005). Lambs born to ewes grazing Panicum coloratum, with sub-clinical levels (51 ppm) of HCN in the grass, can suffer from goitre and other deformities (Cook et al., 2005). Panicum coloratum is mostly used as grazed pasture but can also be used in cut-and-carry systems and also makes good hay and silage (Quattrocchi, 2006; Cook et al., 2005; Suttie, 2000). It is highly palatable, though intense flowering varieties are less relished by stock and palatability declines with maturity (Cook et al., 2005). In Australia, between 28 and 91 day regrowth periods, the DM digestibility measured with sheep in summer ranged from 62% down to 49% whilst in autumn the range was from 55% to 49% (Minson, 1971). In Argentina, good Panicum coloratum hay had a DM digestibility of 62% (Petruzzi et al., 2003). In Australia, cattle preferred Panicum coloratum to Rhodes grass (Chloris gayana), giant star grass (Cynodon plectostachyus), 13 other grasses and legumes including bread grass (Brachiaria brizantha), kikuyu (Pennisetum clandestinum), buffel grass (Cenchrus ciliaris), siratro (Macroptilium atropurpureum) and perennial soybean (Neonotonia wightii) (Lloyd, 1981). In sheep, the intake of Panicum coloratum was considerably lower than for the Guinea grass (Megathyrsus maximus) although the digestibility of both was similar (Minson, 1971). In Argentina, daily gains between 700 and 1000 g/day have been reported with cattle grazing Panicum coloratum (cv. Bambatsi) in the Pampas. Panicum coloratum could support dairy cow requirements without supplementation during winter, as cows grazing it gained 30 g/day during this season while those grazing weeping lovegrass (Eragrostis curvula) lost 500 g/day (Petruzzi et al., 2003). In beef cows, coloured Panicum coloratum was the only grass (among Eragrostis curvula, Digitaria eriantha and Sorghum x almum) that maintained enough quality to be used as deferred forage during late fall and early winter (Ruiz et al., 2004). In lambs, age of regrowth of Panicum coloratum had a negative impact on OM digestibility, OM intake and digestible organic matter intake; all these parameters decrease, from 61.4%, 21.3 g/kg and 13.1 g/kg to 56.9%, 19.2 g/kg and 10.6 g/kg respectively as age of regrowth increased from 6 to 10 weeks. However, the rate of decrease of intake with age of the grass was greater than that of total tract digestibility (Lloyd, 1981; Minson, 1971).